Since The Elixxxirs were representing 2015 (the future!) I thought it would be fun to do something interesting with the drums: a light show triggered by playing. Many have had this idea before — see, for example, Adafruit’s entry on the subject — but so far the examples have fallen a little short of the mark. 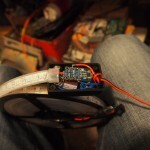 Like the above example, I used an Arduino-based controller (a Trinket) and Neopixel LED strips. For the trigger, I used a piezoelectric sensor, which is what most drum triggers use anyway, besides being cheap and easy to work with. Each unit was built into a small plastic chassis. Assembly was basically trivial; a bit of dead-bugging, soldering directly onto the Trinket. I’ve long wanted to jump to working with AVR chips directly, rather than using the Arduino platform, but the Trinket is so cheap and easy to use that it’s simply not worth the trouble yet. This was also my first experience working with Neopixels. These are great, if not all that cheap. It almost feels like cheating; these parts are basically snap-together. 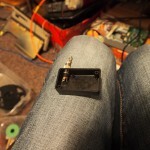 I soldered directly onto the piezo pickup, which is the most fragile part of the whole affair. 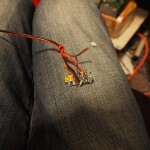 I hot-glued the wires down to help decrease the stress on the solder joints. Particularly when stuck down to the bass drum skin, there’s a lot of motion going on when I’m playing the drums. (See it in slow-motion.) Working with the bare piezo keeps the mass down, but even so, there’s a noticeable damping of the cymbals in particular. I taped the piezo into the underside of each cymbal fairly close to the bell to limit this. The set-up worked flawlessly during the New Years’ show, with a little overzealous taping to keep the power cords in, the triggers attached, etc. ; that won’t be a new requirement for a drummer, who will be used to surprise mid-song cymbal stand failure. This would be a great project even for a drummer who has very limited experience with electronics or programming. The circuit and the code are both just about as easy as they can be. More video to come, I hope! drumset. Picked up some glow in the dark drumsticks too. My son took 1st place in his talent show. You Rock! Damon, tell your son that you two just made my week! That’s fantastic, thanks so much for letting me know. Hi Federico! 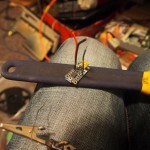 Rather than using trinkets, consider using a single ATTiny85 chip for each of your drums. I’ve tried this and it’s pretty easy and very compact, and these chips are much cheaper than trinkets. I programmed them to use internal oscillators (8mhz) to keep the parts count small. You can program them using an Arduino. – the sketch to use is always the same? 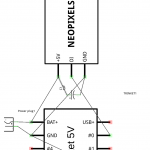 – I must use only “neopixel led”, isn’t right? Hi Federico! I’m glad this might be useful, so I’m happy to help. If you like, you can get rid of HH_LENGTH above and just use the number of lights in the strip instead. hello , i am not sure the connection of sensor. however, the schematic picture. the pin 1 did not connect anything. how to connect it with trinket? Thanks a lot!!! That is useful!!! I change the 1024.0 to 30.0 or 1024.0 to 5000. I find that 30.0 is more brightness than 5000 but more sensitive than 5000. How can I keep its brightness but less sensitive? What is the coding for tuning brightness? The WheelPos is the colour (which just rotates, and doesn’t depend on the piezo sensor), and the intensity (brightness) comes from the piezo sensor. …but of course that’ll mean the lights only go down to half-brightness, no darker than that. Other approaches could be e.g. using 0 for intensity if the value from analogRead is below a certain, and adding a baseline number above that threshold, etc. 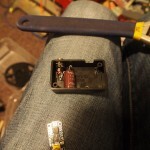 In hardware problem, I find that after I use the drum light device then turn it off. Wait a while, I turn on the device again, the light will turn on automatically even I do not touch the sensor. And after about 30s – 60s, the brightness will decrease and it work correctly. Is it the problem about I use a capacitor 1000uF with 16V and 1M ohm? Sorry, I have a lot question haha. I think something around the resistor R1 might cause a problem like that. Sorry if this is a silly question, but are you sure you’re using a capacitor for C1 and a resistor for R1? I cannot get it to work, Using a gemma. Do I need a different pinout? Code went in as far as I can tell. Mike, I’ve never worked with Gemmas before, but if I were debugging this I’d start by testing the piezo element (e.g. by reading from it and writing the result to the serial connection, testing by prodding it liberally), and separately test the lights by running one of the demos. OK got it working on arduino uno, but only half of the leds are lit 30 out of 60.
ok got it , set snare in length. What are the resistor and cap for? seems to work fine without it. During long rolls, it locks up and goes pink. If you get a sufficient voltage sag when lots of lights are being driven, it’ll cause the processor to lose its tiny mind. If a cap doesn’t do it, make sure your power supply is rated for enough current. I’ll try a 1 MF? I have a 4.7 MF too. I’ll try em both and see which one works. Its on a Pearl Pipe band snare so the rolls are intense. Thanks again. Nice project! Wow. This project exceeded my expectations. Incredible, thank you so much. One question, as I am new to addressable leds. How do I make them pulse from the center out,or ends in? Great, Mike, this is my favourite kind of comment to get. Please post a video if you get the chance and drop a link here! To make it behave differently, just figure out where you want to drop the newest reading on the chain (the second snippet), and then tell it how to move these values on down (the first snippet). You’ll have to tinker with this a little, I’m afraid — if I start throwing pseudocode at you I’ll probably just confuse things. Well it looks like i’ve blown the neopixel strip. I think it may have gotten a transient voltage surge. I was powering it off the 5v output on the Uno. I ran a strand test and only the first 3 will light now. Sorry to hear it, Mike! I’ve been running mine off decent-quality power bricks (about the size and shape of laptop power supplies) — I was using fairly long LED strips and wanted to be sure I wasn’t testing the supply’s limits. I’ll bet lower-power supplies are inherently crappier… maybe it’s worth spending a few extra bucks on a better supply, even if it’s overkill. (Rechargable) batteries would also be a lot safer, plus mobile. Ok, Drummer here. Ive no clue how to do this, but wow this looks exceptional wehn compared to the others. I saw the Adafruit version but it was way too sensitive and kind of flat. Live would get repetitive for me. This circuit looks simple for a drummers mind, and I rather like the circling effect.. Ill only want to make one. For a snare will I have to adjust any code? All you’ll have to adjust is the length of the Neopixel strip (e.g. HH_LENGTH), otherwise you should be set. Let me know if you get stuck — and likewise when you get it done! This looks awesome! I want to hook this up to a cigarbox ukulele and maybe see it light up when I strum. However the issue I am having is that the lights turn off when vibration is detected and are otherwise always on. Any advice? Hi Nicholas! I’m afraid I can’t provide much help beyond suggesting double-checking the circuit. Make sure you corrected the string length in the source code for your particular light strip. You can also distinguish between light-related problems and piezo-related problems by trying out one of the NeoPixel test sketches. Good luck, and please consider linking to a video or something once you’re done! Great, Frederico! Did you post your project somewhere? I’d love to see it. I have already ordered a couple of those Trinkets as i would like to try my luck. I am totally newbie to programming so any advice of what i would need as far as software would very much be appreciated. I am the old school in electronics so Arduino stuff is not by “forte”. Hey Thanos — the Arduino toolkit should already support Trinkets without anything extra needed. You’ll have to get yourself a little oriented e.g. on how to upload code to the Trinket but their tutorials are pretty good. The changes you’re thinking of would be pretty easy to code up; if you want the lights to react all at once and in the same way you could actually save a little cash and just go for a plain LED strip instead of the fancy one I used.